Seda, algodón e hilos metálicos de cobre. In a meadow covered in multicoloured flowers takes place a falconry scene in which three gentlemen observe how a falcon has caught a heron ("although the heron flies very high, the falcon kills"). The composition is circular, so the hand movements and the eyes of the gentlemen point to the falcon and its prey. There is no horizon line. It is a tapestry of the type called of Mille-fleurs, where members of the nobility are usually represented exercising activities and occupations typical of their social condition. Many flowers were chosen according to their symbolic connotations and to the beneficial effects they had both on the body and on the mind. As these hangings were habitually given as presents for engagements, weddings, births and other especially relevant events in the lives of the owners, the symbolism of the ornamental motifs highlighted their virtues and qualities, and usually showed the coat-of-arms of the receiving family as a symbol of prestige. In this case, the falconry theme suggests that it may have been a present for a gentleman, and it is the dog at the centre of the composition, lying on its legs and lifting its head towards the birds, that shows us the collar with the coat-of-arms of the family for whom the tapestry was made: the Nesmonds, of Irish origin, established themselves in France when Henry III of England lost his feuds on the continent at the time of St. Louis and, with the title of duke of Guyenne (Aquitaine), acknowledged himself as a vassal of the French king, who rewarded Edmond d'Esmond for his faithfulness by establishing him in that province. After some time the family, who changed their name into the French form Nesmond, settled in the area of Angoulême, where they owned the castle of Mailloux and became acquainted with the most illustrious French families. Among the flowers which can be identified, we can recognise violets, which played an important role in love poems as a desired flower; daffodils, the symbol of chastity; pansies, which were considered a powerful love philtre; daisies, appreciated as a remedy against excessive sexual desire which may lead to infidelity; stock, the ingestion of which was thought for a time to combat female sterility; carnations, the symbol of engagement and matrimony. Many of these and other flowers were also appreciated because they fought off evil spirits and were considered antidotes against poison and melancholy. Also, white flowers in general were the symbol of purity, red flowers were associated with men, blue flowers with women, and all constituted a love song due to their pleasant scent. Apart from the flowers, there is also some fruit in the bottom centre and left side, and although the varieties are not easily identifiable, in general fruit was a symbol of fecundity, union and regeneration. In the meadow, by the legs of the brown horse, a rabbit also alludes to fecundity, while the dogs were valued, among other qualities, for their faithfulness, and the herons were appreciated for their high flight, and they were considered noble birds, by which an oath was taken when one was due to embark on a new undertaking. All the symbolism suggests that this tapestry was commissioned as an engagement or wedding present of a member of the Nesmond family, since everything rotates around the virtues which both man and woman should possess with the acquisition of their new status. 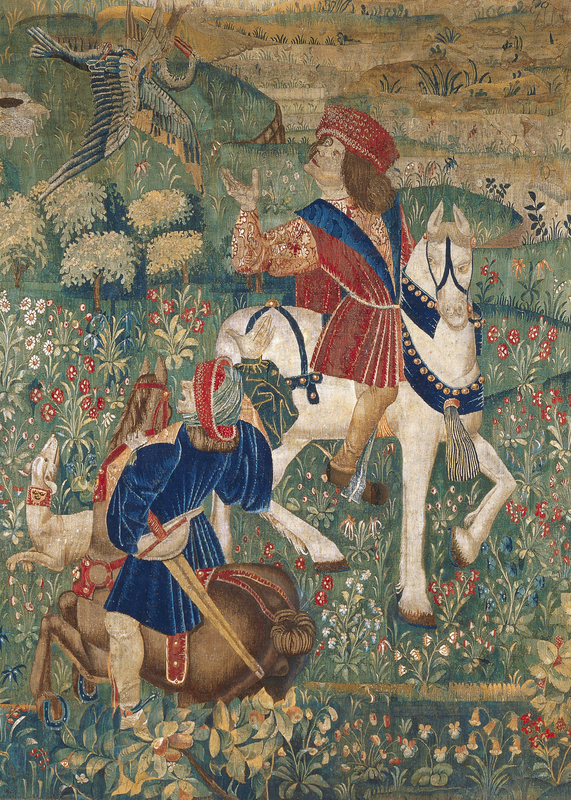 The habit of giving tapestries was generalised among the families of a certain rank, with a variety in the quality of the designs and materials employed. Some details regarding the characters' clothes reflect a fashion which became generalised around 1485-1490 -like the shoes with a flat point, the open sleeves, and the type of head-dress- which enables us to date this hanging around 1500, a period when the genre of the Mille-fleurs was very popular. It is not easy to establish the manufacture where this tapestry may have been made, as it could have been any of the workshops active in the centre of France, some of which were short-lived manufactures, such as those established around the Loire valley, although we cannot exclude that it may have been made in a workshop around the Burgundy area.